The U.S. Air Force School of Aerospace Medicine is an internationally renowned center for aerospace medical learning, consultation, aerospace medical investigations and aircrew health assessments. We promote readiness and protect force and community health by using a range of tools and expertise including environmental and health surveillance, laboratory and risk analysis, process re-engineering, consultation and technological innovation to maximize operational health capabilities and to solve problems through ingenuity and partnerships. We train approximately 6,000 students each year. At 1420, Jan 29, 2018, the situation aboard a C-130H, configured for Aeromedical Evacuation and cruising at 20,000 feet was uneventful. 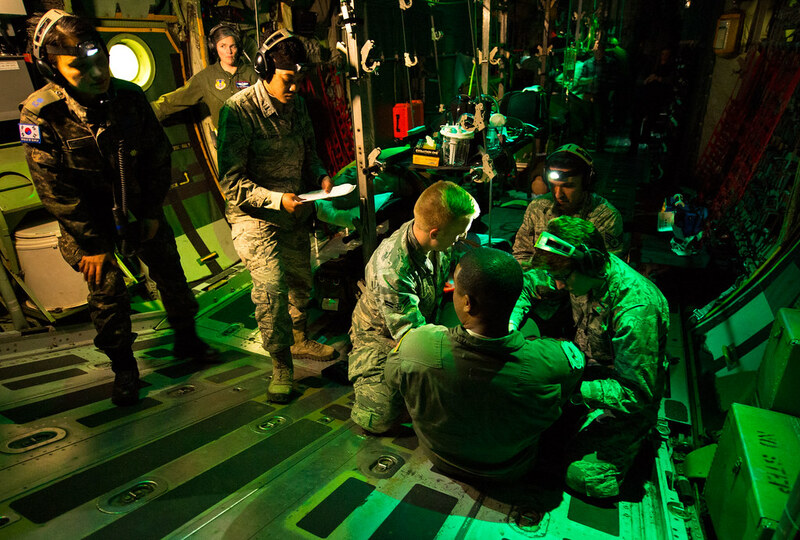 The two teams, each comprised of two flight nurses and three technicians, attended to their six patients varying needs in the dim green glow of the aircraft’s cargo bay. Some patients requested to be moved to a more comfortable position on their litters, which were stacked on supports in the middle of the cargo bay, while others had their vital signs monitored as needed and pain medication was administered through their IV lines. Two of the patients, returning home for treatment of psychological issues, simply needed some softly worded assurances that all was well as they sat in their jump seats. Flight Nurse and Aeromedical Technician Course students try to calm a psych patient, portrayed by Tech. Sgt. Donald Ennis, during a simulated Aeromedical Evacuation mission aboard a C-130 mockup at the 711th Human Performance Wing's U.S. Air Force School of Aerospace Medicine at Wright Patterson AFB, Ohio, Jan. 29, 2018. Then, at 1430, all hell broke loose. One of the psych patients jumped from his seat, screaming above the engine noise, “I can’t do this! I don’t want to do this any more!” and lunged for the rear paratroop door. Two of the nurses grabbed him as they pleaded into their headsets for help from the other crewmembers. As they struggled to subdue the six-foot, two-inch, 220-pound Airman before he could open the door and depressurize the aircraft, another patient with a musculoskeletal arm wound became frightened and tried to get to his feet while still attached to heart and blood pressure monitors and with an intravenous line in his arm. 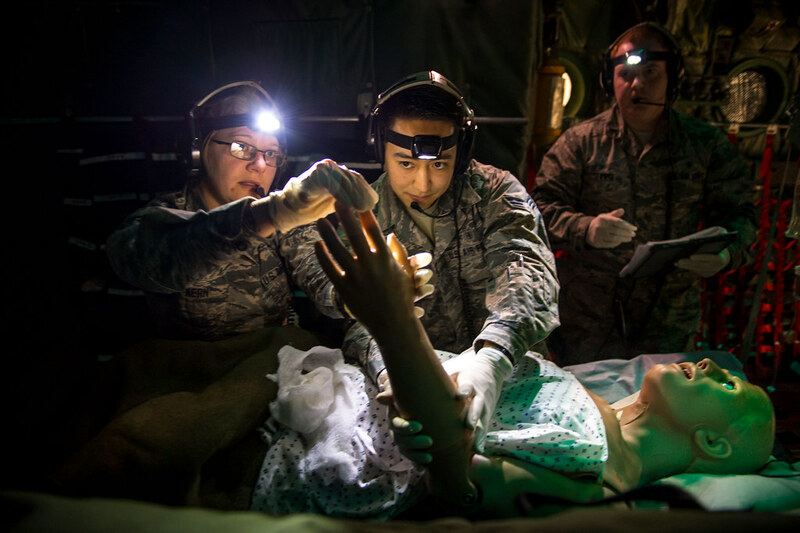 Flight Nurse and Aeromedical Technician Course students, Senior Airman Priscilla Oster and Airman 1st Class Travis Hammack, try to calm a role playing "psych patient", Tech. Sgt. Donald Ennis, during a simulated Aeromedical Evacuation mission aboard a C-130 mockup at the 711th Human Performance Wing's U.S. Air Force School of Aerospace Medicine at Wright Patterson AFB, Ohio, Jan. 29, 2018. Photo by J.M. Eddins Jr.
As all the nurses and technicians’ attention was on the combative patient, trying to restrain him so he could be administered a sedative, the unnerved patient on the litter fell to the bay floor yelling for help, but he could not be heard above the engines and rants of the other patient. It was minutes before the nurses and technicians had the psych patient restrained and noticed the other patient on the floor. Three of them lifted him back onto his litter, asked where he was hurt, reattached leads to his monitor and were reestablishing an IV line, when, suddenly, the noise from the engines ceased. Then the green lights in the bay turned to white. The C-130H did not depressurize and crash when Johnson opened the door because the “aircraft” was, in fact, only inches above ground level. The “patients” on the litters stopped breathing, blinking and bleeding once the lights came on, because they were not actual flesh and bone, but high-fidelity training simulators made of rubber, tubing and motorized actuators controlled by technicians through software on a handheld computer tablet. The “psych patient” was fictional, portrayed by Tech. Sgt. Donald Ennis, Flight Nurse/Aeromedical Evacuation Technician Cadre, at the 711th Human Performance Wing, U.S. Air Force School of Aerospace Medicine’s (USAFSAM) Flight Nurse/Aeromedical Evacuation Technician Course at the Air Force Research Laboratory at Wright Patterson Air Force Base, Ohio. 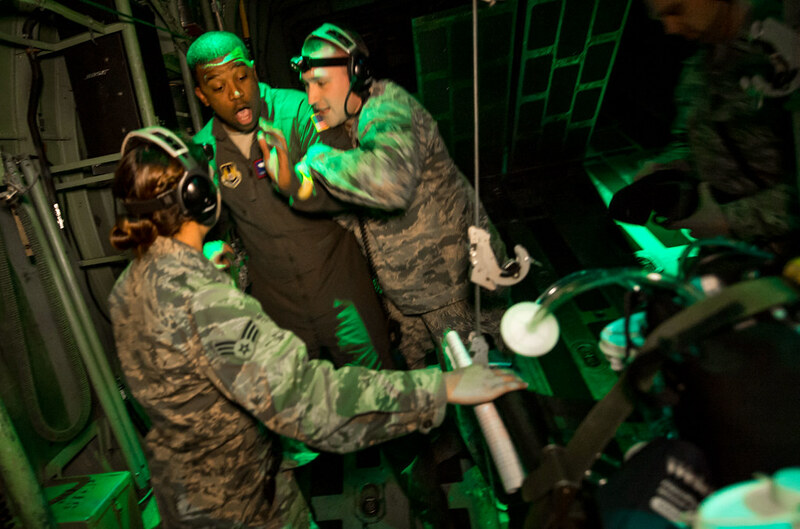 The entire mission was part of the hands-on training during which USAFSAM exposes students from around the world to various types of wartime injuries and the realism of flying on Air Force cargo aircraft during an aeromedical evacuation mission, all while safely at ground level in Building 840 at Wright Patterson AFB. Patient simulators, which can blink, speak, bleed and allow students to monitor vital signs and administer drugs, are used for aeromedial evacuation training by active-duty, reserve and ANG Airmen, as well as, members of other services and partner nations, aboard C-17 and C-130 mockups during the Flight Nurse and Aeromedical Technician Course at the 711th Human Performance Wing's U.S. Air Force School of Aerospace Medicine at Wright Patterson AFB, Ohio, Jan. 29, 2018. While this training evolution is by no means representative of the typical Aeromedical Evacuation mission, the extreme circumstances of the simulation drive home the importance of crew resource management and communication to mission success. Learning to maintain those tools in an extreme environment will foster their habitual use during less dramatic missions. The psych patient meltdown scenario is designed in particular to keep the student’s head on a swivel while maintaining awareness of all the patients’ needs and keeping the lines of communication between team members open and flowing. 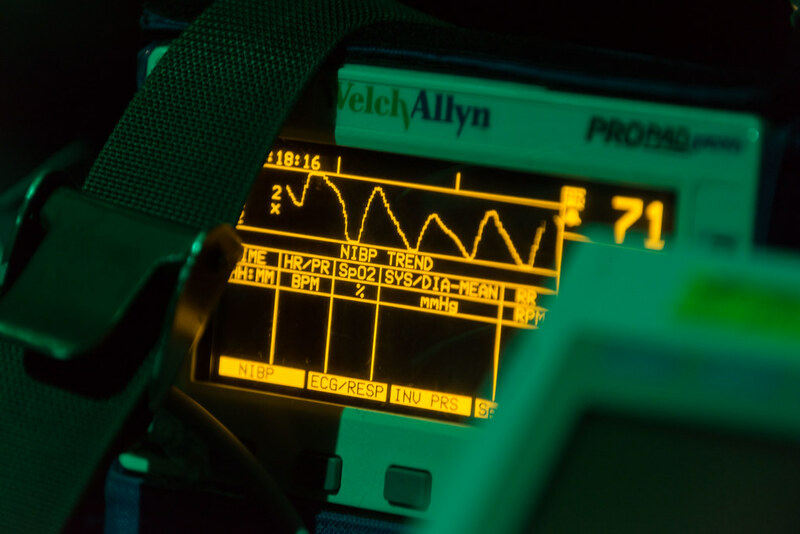 A vital-sign monitor attached to a patient simulator is used in the aeromedical evacuation training of active-duty, reserve and ANG Airmen, as well as, members of other services and partner nations, aboard a C-130 mockup during the Flight Nurse and Aeromedical Technician Course at the 711th Human Performance Wing's U.S. Air Force School of Aerospace Medicine at Wright Patterson AFB, Ohio, Jan. 29, 2018. 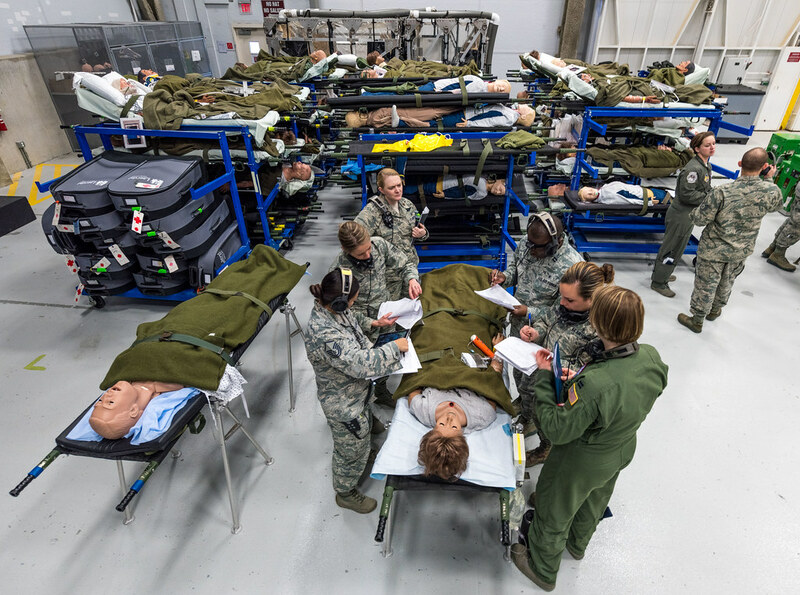 Flight Nurse and Aeromedical Evacuation Technician students complete 40 hours of missions on the C-130H mockup as part of their ground training check-rides. The High Bay in Building 840 houses two C-130 mockups as well as a C-17 mockup, to accommodate the Flight Nurse and Aeromedical Evacuation Technician Course and other aeromedical evacuation courses at USAFSAM. Each “aircraft” can simulate the lighting, sounds (from normal engine noises to explosions and crash landings) and the heating and cooling conditions that can be experienced onboard actual AE missions. Cabin decompression also can be simulated with students having to don supplemental oxygen systems while maintaining care of their patients. Just two years ago, the course still consisted of mainly PowerPoint presentations and in-class lectures. Now the students work hands-on in the simulator for 50 percent of their time in Dayton, Ohio. Flight Nurse and Aeromedical Technician Course students discuss patient briefs from actual Aeromedical Evacuation missions with their instructor, Tech. Sgt. 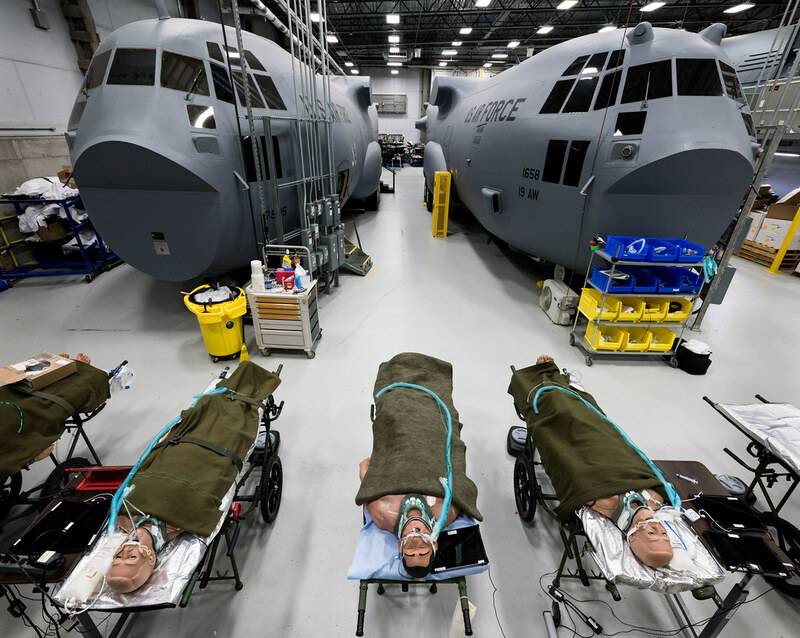 Christina Johnson, center, before boarding a C-130 mockup to treat simulated patients at the 711th Human Performance Wing's U.S. Air Force School of Aerospace Medicine at Wright Patterson AFB, Ohio, Jan. 29, 2018. The students come from guard, reserve and active-duty Air Force units as well as sister services, the Department of Defense and partner nations. While the Air Force maintains 31 AE units, only four are active duty, so classes often have a majority of National Guard and Air Force Reserve personnel. 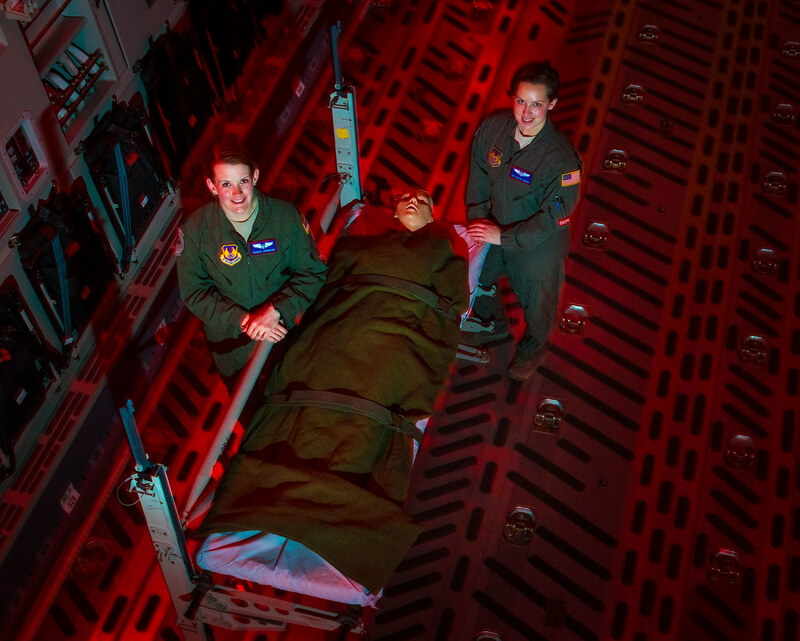 According to Johnson, personnel from sister services and partner nations, often attend as an introduction to aeromedical evacuation, as they may be going to a command and control units and need to understand the capabilities and responsibilities of AE crews. International students from the militaries of Allied Nations have been attending the course since the early 1960s leading to partnerships with more than 100 countries. The team that Tech. Sgt. Johnson is instructing includes an officer in the South Korean Air Force, Maj. Sun A Lee, who is a chief manager of her country’s aerospace nursing division and is responsible for teaching air evacuation techniques, critical nursing and emergency medicine to junior officers. Tech. Sgt. Johnson believes that the international students provide a unique opportunity for instructors, as well as the students, to see methods that partner nations use to provide patient care. “It’s called global patient movement for a reason,” she said. Tech. Sgt. 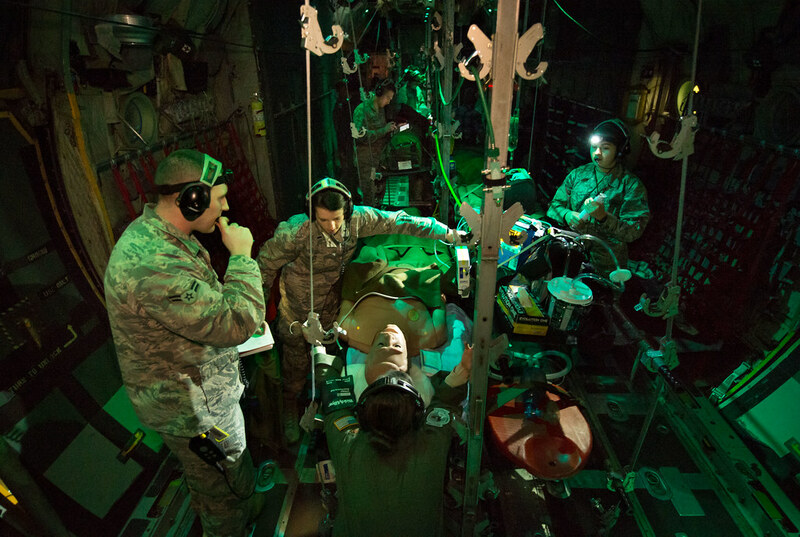 Johnson knows from real-world experience the many facets that must come together to effectively and safely care for patients while airborne. Her 10-year career in AE began with caring for patients in-flight, transitioned to learning the command and control component by organizing and directing AE missions for the entire Pacific Theater as a C2 agent for Pacific Air Forces and has culminated with her four years at the schoolhouse in Dayton, passing on her experience to the next generations of flight nurses and technicians. Still, her own education must stay up to date to function effectively as an educator. 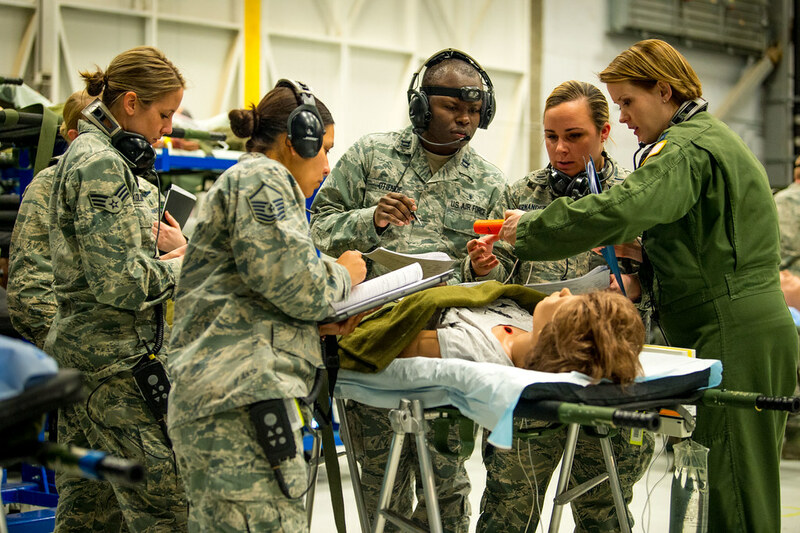 One of the key evolutions in the Aeromedical Flight Nurse and Aeromedical Evacuation Technician Course is the foundational reality of the simulations. While the patients are not real people, their cases come from the most up to date real-word experiences of AE crews. 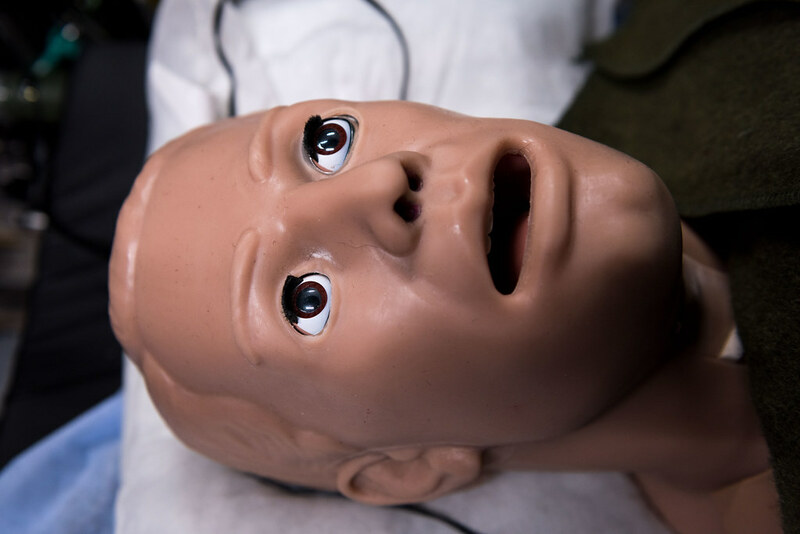 A patient simulator, which can blink, speak, bleed and allow students to monitor vital signs and administer drugs, is used for aeromedical evacuation training by active-duty, reserve and ANG Airmen, as well as, members of other services and partner nations, aboard C-17 and C-130 mockups during the Flight Nurse and Aeromedical Technician Course at the 711th Human Performance Wing's U.S. Air Force School of Aerospace Medicine at Wright Patterson AFB, Ohio, Jan. 29, 2018. The U.S. Transportation Command Regulating and Command and Control Evacuation System, or TRAC2ES, was designed to manage the movement of patients, give commands involved in the missions patient and asset visibility, including while in-transit, as well as management of lift-bed resources and collaborative support for patient movement requests and mission execution within and between theaters. 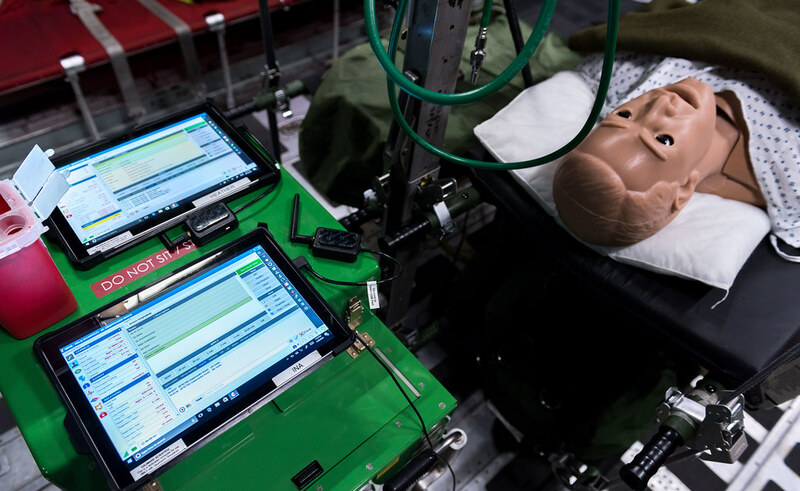 USAFSAM quickly realized the paperwork generated by the TRAC2ES system to manage patient movement and guide treatment while in-transit could be used as a real-time, real-world, training tool for their students. Capt. Johnson believes that these real-world cases can also prepare students for the types and frequency of certain types of injuries indicative of particular areas of operations to which they may deploy, from infections to concussive head wounds to bullet wounds to burns. It also gets them accustomed to using the actual paperwork they will be issued when briefed on each patient they will care for in-flight. 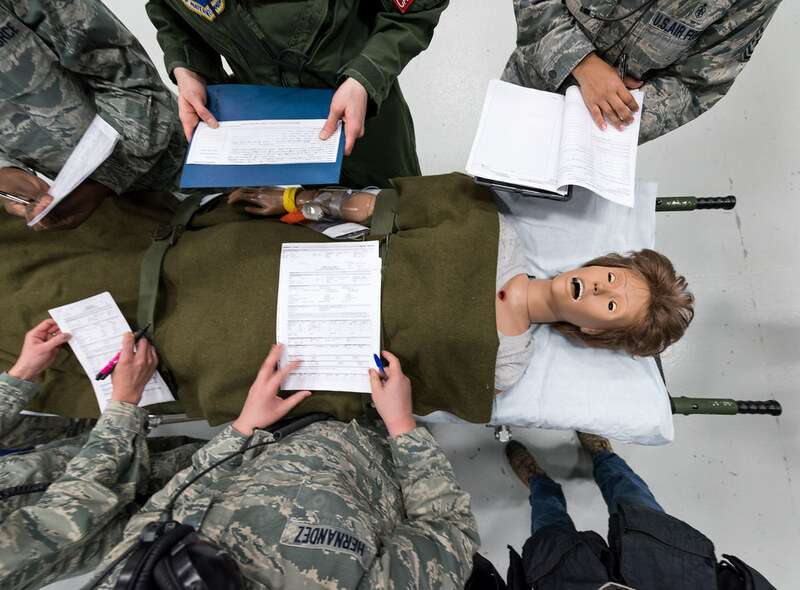 She adds that the USAFSAM Flight Nurse and Aeromedical Technician Course not only enables students to go into a high stress, but low-threat, environment where they are free to make mistakes and learn from them without having to worry about injuring a real patient. 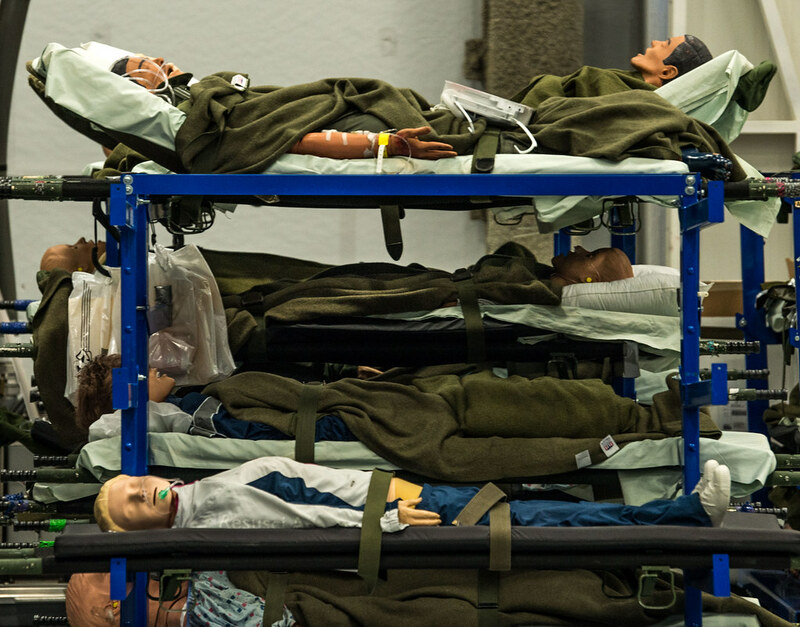 Patient simulators used in the aeromedical evacuation training of active-duty, reserve and ANG Airmen, as well as, members of other services and partner nations, aboard a C-130 mockup during the Flight Nurse and Aeromedical Technician Course, await use on racks in the high bay area or the 711th Human Performance Wing's U.S. Air Force School of Aerospace Medicine at Wright Patterson AFB, Ohio, Jan. 29, 2018. (Photo // J.M. Eddins Jr. Still, for the new students, the fidelity of the patient scenarios coupled with the realism of the aircraft environment and disease processes at altitude can be bewildering for even the most experienced students. 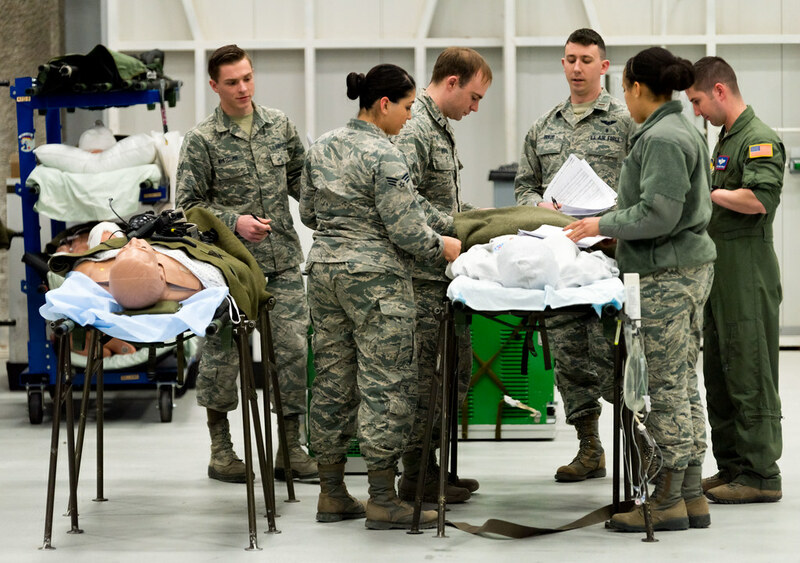 “Active-duty technicians and nurses are trained the Air Force way and then you have the guard and reserve members who potentially have been working in the emergency room or Intensive Care Unit for 10 or 15 years,” said Capt. Johnson. “They have a wealth of knowledge and are very good at their jobs, but then you bring them here and everyone’s kind of on a level playing field. For 1st Lt. Toya Williams, of the 36th Aeromedical Evacuation Squadron at Keesler AFB, Mississippi, learning in a well-lit, quiet classroom about how a patient’s body changes at altitude affects how she administers treatment takes on a whole new dimension during simulations. Airman 1st Class Travis Chadwick, of the 187th Aeromedical Evacuation Squadron of the Wyoming Air National Guard, is relatively new to the medical career field but is using the experience of not only his instructors, but also his classmates to expand his AE knowledge base. For Capt. Johnson the Flight Nurse Course and Aeromedical Evacuation Technician Course is a very different experience for her students than when she went through the course just four years ago. Capt. Sarah Johnson and Tech. Sgt. Christina Johnson, instructors for the Flight Nurse and Aeromedical Technician Course of the 711th Human Performance Wing's U.S. Air Force School of Aerospace Medicine at Wright Patterson AFB, Ohio, stand in the bay of a C-17 mockup beside a patient training simulator, Jan. 29, 2018. “We use a learning management system online where our students are able to access PowerPoints and information prior to coming to the course as well as during the course,” said Capt. Johnson. “So some of our modules are things the students need to accomplish within the first five days. They are able to learn about crew resource management, aircrew basics. There are videos on how the air medical evacuation equipment operates and preloaded lectures.